“For every Crusade and Revolution and Civil War,” he explains further, “there have always been those who argued, with great clarity, that violence not only was immoral but that it was even a less effective means of achieving laudable goals.” Joining the chorus of dissidents, Kurlansky attempts to shed light on the epic failures of warfare to secure peace, as well as to cultivate a new understanding of “the way in which things actually happen” in history. Author of previous works including Salt: A World History and Cod: A Biography of the Fish That Changed the World, Kurlansky has established himself as a pioneer in the field of micro-history, producing idiosyncratic investigations into small topics that bloom into tales of broad general interest. In his new book, he shows a command of a sweeping body of pacifist history, and he makes centuries of material flow into an overview that is far more combative than its protagonists’ peaceful ways might suggest. A standard narrative of nonviolence as a modern political instrument — especially in the United States — might start sometime around the time of Henry David Thoreau, who, sitting in jail for war tax resistance, first argued that civil disobedience could undermine the legitimacy of the state and provoke a crisis in governance. The story might mention “peace churches” like the Quakers and their creation of a pacifist way of life based on Jesus’s teachings. But it would soon rush forward to figures like Gandhi, who pioneered the strategy of how to apply nonviolent disruption on a mass scale, and to Martin Luther King Jr., Gandhi’s most famous American importer. Kurlansky spends the bulk of his short book progressing from ancient China to the dawn of the 20th Century, profiling groups that rejected the “ideology of warfare.” The ranks of the war resisters include early Christians, the French Cathars, Protestants like the Anabaptists, Mennonites, and Quakers, white Americans in the abolitionist movement (African-Americans tended to be more open to supporting violent slave rebellions), and the international peace organizations of the 19th century. 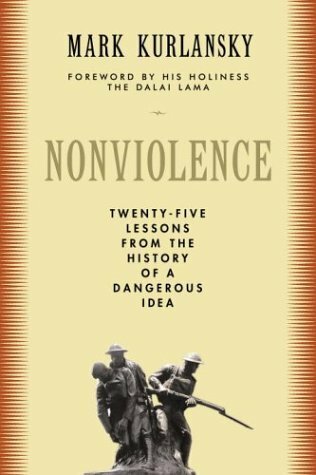 Early on in the book the distinction between two closely related ideas, pacifism and nonviolence, becomes important. “Pacifism is passive,” Kurlansky acknowledges; it is a “state of mind” that rejects war and aggression. “Nonviolence, exactly like violence, is a means of persuasion, a technique for political activism, a recipe for prevailing;” it uses tactics such as marches, boycotts, strikes, and sit-ins to provoke social conflict to advance a cause. The author purports to be concerned with the latter. But in fact the groups he traces are generally active only in the sense that they might preach against war and face sometimes severe persecution for their refusal to take up arms. They are not nonviolent in the manner of the lunch-counter sit-ins of the civil rights movement, which forced a confrontation around desegregation. By the end of the book, it’s clear that Kurlansky himself is a pacifist, although he never admits it outright. While he may well be supportive of active nonviolence, time and again his attention returns to pacifism. His primary concern is to “end war” in toto, not to use nonviolent persuasion to advance other causes. Tactical innovators in nonviolence consistently receive short shrift: Thoreau is among the many theorists he mentions only in passing. Gandhi and Martin Luther King receive just a few pages each, and it would be difficult for a reader to understand their distinctive contributions. The subtitle’s promise of a tutorial notwithstanding (Kurlansky’s “25 lessons” are scattered throughout the text and only enumerated explicitly in an appendix), there is little in the book of concrete usefulness for a modern-day practitioner of nonviolence seeking to engage in creative social disruption. The book has rather more to offer a conscientious objector heading for a draft interview. Kurlansky can be heavy-handed at times, especially when he’s drawing parallels between his lessons from history and our present state of war. (When he uses historical examples to show that war-mongers will inevitably denounce nonviolent critics as immoral traitors and will always claim to have God on their side, the implications for today are plenty clear without him calling out Karl Rove and President Bush by name.) Yet Kurlansky can also be a compelling narrator, willing to dive in to age-old debates without intellectual hesitation. At the core of Nonviolence lies a series of “What if…?” scenarios questioning whether the major wars of U.S. history might have been averted. Many of the book’s arguments were famously foreshadowed twenty-five years ago in Howard Zinn’s war-resister-friendly A People’s History of the United States. Still, they remain rare and relevant in our current political discussion. Once the guns start firing, Kurlansky observes, debate about the necessity of a war ceases, at least for a time. To that we can add: Once a war is enshrined and justified in the history textbooks, popular reappraisal will be long in coming. The American Revolution, from the pacifist’s perspective, “was a brutal civil conflict” where “[c]ivilians would run in terror at the approach of either army. Homes were sacked and women were raped.” Worse yet, it was arguably superfluous. As John Adams wrote to Thomas Jefferson years afterward, “The revolution was in the minds of the people, and in the union of the colonies, both of which were accomplished before the hostilities commenced.” Kurlansky concludes from this that colonists could have expelled the British by continuing a program of nonviolent protests and acts of economic resistance like the Boston Tea Party. The same quotes from Adams appeared not long ago in Jonathan Schell’s The Unconquerable World, although Schell used them only to say that, since the revolution had been completed before military engagement commenced, the war was therefore one of self-defense against re-colonization. Kurlansky goes much further in suggesting that the war was altogether unnecessary. This is a bold proposition, something that could no doubt keep a conference of historians indoors debating through a sunny weekend. But it is also an important challenge to America’s founding myth, opening the door for a wider reinterpretation of who we are, and what we might become, as a nation. Kurlansky goes on to take issue with the idea that the Civil War was an effective means of ending slavery. The Union Army, of course, did not set out to free the slaves. Such a cause would not have been well received in the North as a justification for the conflict. President Lincoln pronounced that his objective was “not either to save or destroy slavery… If I could save the Union without freeing any slave, I would do it.” When the Emancipation Proclamation finally came, it cynically applied only to rebel territory and not to border states within the Union that permitted slavery, like Maryland. Could the abolitionist movement of Frederick Douglass and William Lloyd Garrison have won a more decisive end to slavery without the war? We can’t know. It is worth noting, though, that the freedom ultimately afforded to Southern blacks by the war proved limited, and it took a nonviolent movement, a century later, to secure any genuine protection for their basic civil rights. It’s not hard to think of objections to Kurlansky’s reading of this war. He argues that nonviolent resistance in Denmark proved far more effective at saving Jews than did militaristic uprisings in other countries. True, the Germans succeeded in deporting only about 400 of Denmark’s 6,000 Jews, while in the Netherlands, where there was armed resistance, over 100,000 members of a Jewish community of 140,000 were killed. But certainly the Nazis might have made a more concerted effort if the Danish had a larger Jewish population — and if their army was not preoccupied with fighting a war on multiple fronts. Moreover, Kurlansky contends that “only in the isolation and brutality of wartime” did Hitler launch the “final solution;” he had previously entertained ideas of merely deporting all Jews to Madagascar. Be this as it may, it remains fanciful to think that the fate of Jewish Europeans would have been rosy had fascism progressed unchecked by military force. What is missing from the book is just the sort of reckoning with the price of nonviolence that Orwell respected in Gandhi. “If you are not prepared to take a life, you must often be prepared for lives to be lost in some other way,” Orwell wrote. Yet Kurlansky ultimately dodges the question of how the spread of fascism could have been stopped without the force of arms. He never sketches a strategy of nonviolent resistance that might have sacrificed many thousands of lives to stop the Nazis. Absent this, the alternate history he implies seems unrealistically bloodless in a way that hard-nosed advocacy of nonviolence need not be. After all, the war itself required millions of sacrificed lives and also ushered in the age of nuclear war. However grotesque the demands of nonviolence might be, they might still compare favorably. Kurlansky’s arguments are valuable not because they are always airtight, but rather because such contentions are rarely considered at all. It would never cross the minds of most Americans to question the necessity of the patriots taking up arms against the British or U.S. soldiers landing on the beaches of Normandy. Given that our government was all too easily able to obtain support for launching its current war, and that Iraq is unlikely to be our last military adventure of the 21st century, this is surely a costly failure of imagination.